At Myotek, we recognize the importance of investing in technology to stay on the cutting edge. Having the capability to machine and 3D print parts in-house, enables us to quickly evaluate and improve products during the design phase. These benefits are especially apparent to our customers who value the benefit being able to evaluate prototypes and reaches well beyond reviewing CAD models. Myotek’s Vision-Based Photometer provides real-time measurement of Cut-Off Angle, Gradient Value, and Total Light Output. This precision CCD camera system is designed to give comparable photometric values to a goniometer in a fraction of the time. The quick acquisition and storage of light pattern data is beneficial for evaluating product performance during all phases of development. All of our products are designed to exceed SAE, ECE-F3, CCC guidelines. 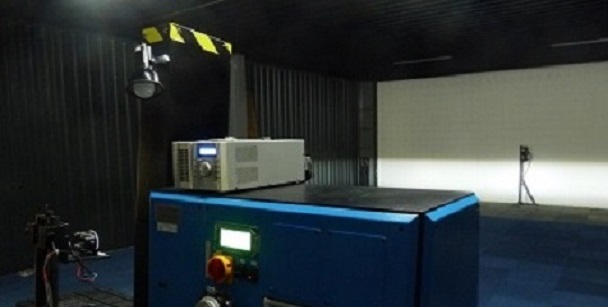 Photometric testing is an essential part of our part approval process in meeting customer requirements. Myotek uses the most powerful and advanced computer aided design tools for optimizing our lighting products. We are equipped with the ability to exchange files and design in multiple platforms including LucidShape, ASAP, NX, Catia, SolidWorks, ProE, (supporting .stp, .igs, .dxf, .dwg, and .ies data transfer). Precision Machining for Optics and Heatsinks. IN HOUSE Sputtering Chamber for Metalizing Reflectors. Myotek LED constant current drivers are designed to efficiently opererate our automotive lighting products and meet vehicle EMI regulatory requirements at the component and vehicle level.